Have you ever seen an old wooden cupboard quite black with age, and ornamented with carved foliage and curious figures? Well, just such a cupboard stood in a parlor, and had been left to the family as a legacy by the great-grandmother. It was covered from top to bottom with carved roses and tulips; the most curious scrolls were drawn upon it, and out of them peeped little stags' heads, with antlers. In the middle of the cupboard door was the carved figure of a man most ridiculous to look at. He grinned at you, for no one could call it laughing. He had goat's legs, little horns on his head, and a long beard; the children in the room always called him, “Major general-field-sergeant-commander Billy-goat's-legs.” It was certainly a very difficult name to pronounce, and there are very few who ever receive such a title, but then it seemed wonderful how he came to be carved at all; yet there he was, always looking at the table under the looking-glass, where stood a very pretty little shepherdess made of china. Her shoes were gilt, and her dress had a red rose or an ornament. She wore a hat, and carried a crook, that were both gilded, and looked very bright and pretty. Close by her side stood a little chimney-sweep, as black as coal, and also made of china. 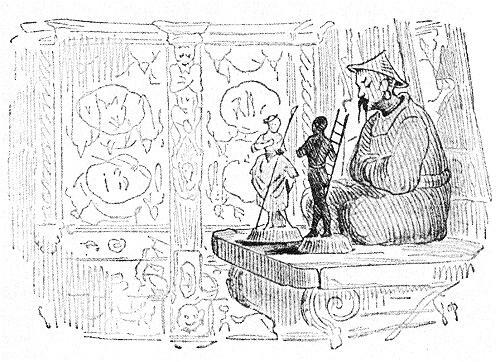 He was, however, quite as clean and neat as any other china figure; he only represented a black chimney-sweep, and the china workers might just as well have made him a prince, had they felt inclined to do so. Close to them stood another figure, three times as large as they were, and also made of china. He was an old Chinaman, who could nod his head, and used to pretend that he was the grandfather of the shepherdess, although he could not prove it. 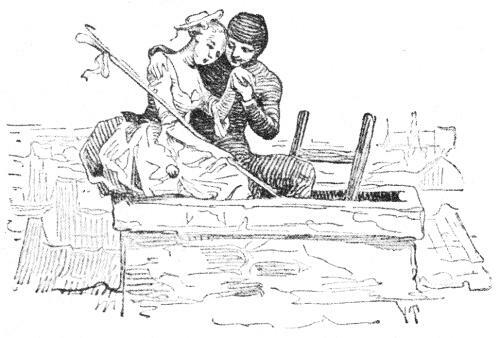 He however assumed authority over her, and therefore when “Major-general-field-sergeant-commander Billy-goat's-legs” asked for the little shepherdess to be his wife, he nodded his head to show that he consented. Here were three or four packs of cards not quite complete, and a doll's theatre, which had been built up very neatly. A comedy was being performed in it, and all the queens of diamonds, clubs, and hearts,, and spades, sat in the first row fanning themselves with tulips, and behind them stood all the knaves, showing that they had heads above and below as playing cards generally have. The play was about two lovers, who were not allowed to marry, and the shepherdess wept because it was so like her own story. “I cannot bear it,” said she, “I must get out of the drawer;” but when they reached the floor, and cast their eyes on the table, there was the old Chinaman awake and shaking his whole body, till all at once down he came on the floor, “plump.” “The old Chinaman is coming,” cried the little shepherdess in a fright, and down she fell on one knee. And so the little china people remained together, and were glad of the grandfather's rivet, and continued to love each other till they were broken to pieces. Chu vi iam vidis vere malnovmodan shrankon, tute nigran pro maljuneco kaj kun skulptitaj spiralajhoj kaj foliajhoj? Ghuste tia staris en unu loghejo. Ghi estis heredajho el la tempo de la praavino, kaj la skulptajho, per kiu ghi estis kovrita de supre ghis malsupre, prezentis rozojn kaj tulipojn. La plej strangaj spiralajhoj trovighis sur ghi, kaj el ili elstaris malgrandaj kapoj de cervoj kun multepintaj kornoj. Sed en la mezo sur la shranko staris skulptita tuta viro; li havis ridindan aspekton, kaj li mem efektive ridis, au pli ghuste li rikanis, char oni neniel povis tion nomi ridado. Krom tio li havis kaprajn piedojn, malgrandajn kornojn, elirantajn el la frunto, kaj longan barbon. La infanoj, kiuj ordinare ludadis en la chambro, nomis lin chiam la kapropieda supera kaj suba generala chefmilitestro. Lia nomo estis konforma al lia aspekto; kiel lia formo estis skulptita kun granda malfacileco, tiel ankau lia nomo estis tre malfacile elparolebla, kaj ne ekzistas multe da homoj, kiuj povus fieri per tia titolo. Multe da arto kaj penoj estis eluzita, por ekzistigi lin. Seninterrompe li rigardadis al la tualeta tablo, char tie staris charma malgranda pashtistino el porcelano. Shiaj shuoj estis oritaj, shia vesto estis belete bukita per rozo, kaj krom tio shi havis oran chapelon kaj pashtistan bastonon; shi estis io charma, Tute apud shi staris malgranda kamentubisto, karbonigra, sed ankau el porcelano. Li estis tiel same eleganta kaj pura, kiel chiu alia; ke li prezentis kamentubiston, tio estis kauzita nur de kaprico de la fabrikisto de porcelanajhoj; chi tiu tiel same bone povus fari el li reghidon, char estis tute egale. Tre charme li staris tie kun sia shtupetaro kaj kun vere knabina vizagho kiel lakto kaj sango, kaj tio en efektiveco estis eraro, char iom nigra li ja povus esti. Li staris plej proksime de la pashtistino. Ambau ili estis starigitaj tie, kie ili staris, kaj char ili estis starigitaj tiel proksime, ili interfianchighis. Kaj efektive tio estis tre ghusta partio, ambau estis junaj, ambau estis el la sama porcelano kaj egale rompeblaj. Proksime de ili staris ankorau alia figuro de triobla grandeco. Ghi prezentis maljunan Hhinon, kiu povosciis balanci la kapon; li ankau estis el porcelano, kaj li diris, ke li estas la avo de la malgranda pashtistino, kion li tamen ne povis pruvi. Li asertis, ke li havas potencon super shi, kaj tial al la kapropieda supera kaj suba generala chefmilitestro, kiu svatighis pri la malgranda pashtistino, li kapbalancis sian jeson. “Tiam vi estos la dekdua!” diris la Hhino. “Kiam hodiau nokte krakos en la malnova shranko, vi festos vian interedzighon, kiel mi estas Hhino!” Kaj li ekbalancis la kapon kaj endormighis. Sed la pastistino ploris kaj rigardis sian plejamaton, la porcelanan kamentubiston. Forta teruro atakis ilin, kaj rapide ili ensaltis en la fakon de la subfenestra benko. Tie kushis tri au kvar ludkartaroj, kiuj estis ne kompletaj, kaj malgranda pupa teatro, kiu, kiom la cirkonstancoj tion permesis, estis aranghita por ludo. Tie oni ghuste en tiu momento ludis komedion, kaj chiuj damoj, la karoa, kera, trefa kaj pika, sidis en la unua vico kaj ventumadis sin per siaj tulipoj, kaj post ili staris chiuj buboj kaj montris, ke ili havas kapon, ech ne sole supre, sed ankau malsupre, kiel la ludkartoj ja ordinare havas. La teatrajho traktis pri du geamantoj, al kiuj la sorto ne permesis ricevi sin reciproke, kaj la pashtistino ploris pri tio, char tio estis kiel shia propra historio. “Mi ne povas tion elteni!” shi ekkriis. “Mi devas eliri el la fako.” Sed kiam ili denove staris sur la planko kaj ekrigardis al la tablo supren, ili vidis, ke la maljuna Hhino vekighis kaj balancighadis per la tuta korpo; en sia malsupra parto li estis ja nur bulo. “Jen venas la maljuna Hhino!” ekkriis la malgranda pashtistino kaj falis pro aflikto sur siajn porcelanajn genuojn. “Mi pripensis!” shi diris decide. Kaj li alkondukis shin al la pordeto de la forno. “Hu, kiel nigre tie estas!” shi diris, shi tamen iris kun li tra la interno kaj tra la tubo, kie shin chirkauis plej mallumega nokto. Efektive tio estis stelo en la chielo, kiu lumis rekte sur ilin, kvazau ghi volus montri al ili la vojon. Kaj ili grimpis kaj grimpis sur abomeninda vojo tiel alten, tiel alten. Sed li levadis kaj shovadis, li tenis shin kaj montradis al shi la plej bonajn lokojn, kien shi devas meti siajn porcelanajn piedetojn. Tiel ili iom post iom tragrimpis ghis la rando de la kamentubo kaj sidighis sur ghi, char ili estis forte lacaj, pri kio certe neniu miros. Alte super ili etendighis la chielo kun chiuj siaj steloj, kaj sub ili vidighis la tegmentoj de la domoj. Vasta panoramo prezentighis al ili, malproksima vido sur la grandan mondon. Tiel la kompatinda pashtistino ghin ne imagis al si; shi apogis sian kapeton al sia kamentubisto kaj ploris tiel maldolche, ke la oro de shia zono desaltis. La kamentubisto admonis shin per prudento, direktis la interparoladon sur la maljunan Hhinon kaj la kapropiedan superan kaj suban generalan chefmilitestron, sed shi ghemploris tiel, ke ech shtono au pli ghuste porcelano devis molighi, kaj shi kisis sian malgrandan kamentubiston tiel kore, ke li ne povis shin deteni, por ne cedi al shi, kiel ajn malsagha tio estis. Tiel ili nun denove kun granda malfacileco grimpis tra la kamentubo malsupren, rampis tra la interno kaj tra la tubo, kio certe ne estis io agrabla, kaj jen ili staris en la malluma forno. Tie ili auskultis malantau la pordeto, por sciighi, kiel la aferoj staras en la chambro. En ghi estis tute silente; ili elrigardis, – ha, tie kushis la Hino meze sur la planko, li estis falinta de la tablo, kiam li volis postkuri ilin, kaj li kushis rompita en tri pecojn. La tuta dorso deapartighis kiel unu peco, kaj la kapo rulighis en angulon. La kapropieda supera kaj suba generala chefmilitestro staris tie, kie li chiam staris kaj meditis. “Estas terure!” diris la malgranda pashtistino, “la maljuna aveto disrompighis en pecojn, kaj ni estas kulpaj pri tio. Tion mi ne povas postvivi!” Kaj shi tordis siajn malgrandajn manetojn. “Tiel vi opinias?” shi demandis. Kaj tiam ili returne grimpis sur la tablon kaj starighis sur sia antaua loko. Kaj oni lin kungluis. La posedantoj lasis cementi lin en la dorso, bona vinkto estis trametita tra lia kolo, kaj li farighis kiel nova, nur balanci la kapon li plu ne povis. La kamentubisto kaj la malgranda pashtistino petege rigardis la maljunan Hhinon; ili timis, ke li kapjesos; sed li ne povis tion fari; kaj li ne volis rakonti al fremdulo, ke li havas konstantan vinkton en la nuko. Tial la porcelanaj hometoj restis kune kaj benis la vinkton de la aveto kaj amis sin reciproke, ghis ili rompighis. * - В старину в комнатах ставили для запаха вазы с сухими цветами и травами; смесь эта посыпалась солью, чтобы сильнее пахла.